Peshawar (Monday, May 16, 2016): National savings of Pakistan is here to arrange the draw number 14th of Student Prize bond Rs. 100 on 16th of May 2016 at Peshawar city today. Serial wise this is common draw number 14 (Fourteen). 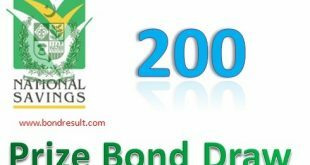 The Prize Bond 100 Draw list will be updated here on 16-5-2016 at this page. All the prize bond holder of worth Rs.100 can download the Result Draw Full List 16 May 2016 At PESHAWAR city. This lowest prize bond is the most bought in low budget folks and lower scale Govt empolyee to win the race in little money. The prize bond this number are very low. And here by I dislike to buy it for third prize. But If anyone can get the first or second prize then he is winner and no fortune like that. National saving of Pakistan Rs 100 Prize bond Draw List 16th May 2016 at Peshawar city. The State Bank of Pakistan’s seven 100 worth of prize bond draw on the eve of the general public were also given the opportunity to The State Bank of the main gate of the people allowed into the building after showing ID card was given. Qura,andari or draw on the State Bank of Pakistan has made special arrangements for security in Lahore. This has also posted lists of those receiving awards. Prizebond 100 Lucky draw list 16.5.2016 Monday online by saving.gov.pk. You can download Prize Bond Full List Rs.100 PASHAWAR 16 MAY 2016 online here.